Heart attack and strokes are more likely to kill firefighters than an actual fire. A recent research article just confirmed one of the major reasons why. The research confirms that the physical demands of firefighting may trigger the formation of blood clots and impair blood vessel function -- two factors associated with increased risk of heart attack and stroke. (You can read more about that research by clicking here.) 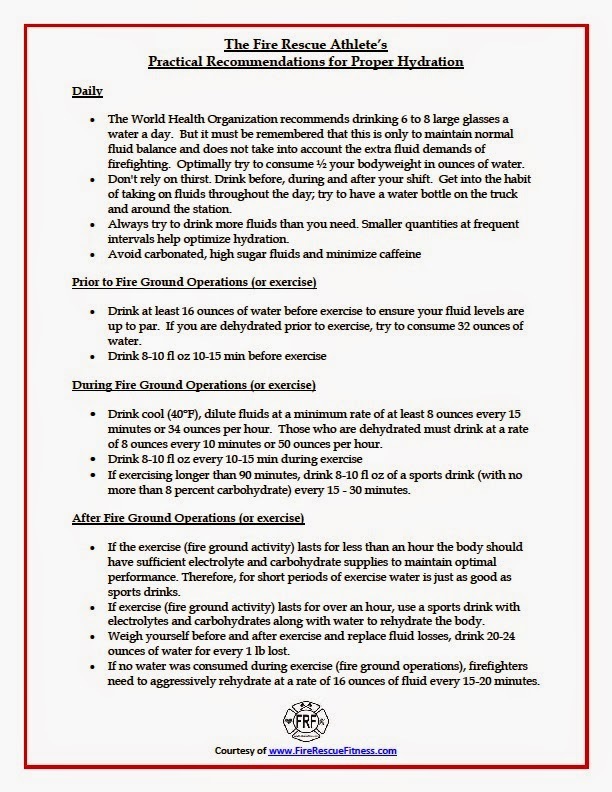 The research also confirms the importance of proper fitness and hydration in firefighters. Take a look at the article below and make sure you (and your crew) stays hydrated. It can save your life! To stop dehydration before it starts prior to the alarm for a service call, you must limit the use of stimulants, such as caffeine, avoid carbonated beverages, maintain physical fitness and stay adequately hydrated throughout a shift. Drink plenty of water at regular intervals, and aim to replace fluids at the same rate that they’re lost. At minimum, consume 64 oz. of water a day (Casa et al., 2000). Increase that amount when exercising on duty and after you've completed your workout to avoid being dehydrated at the scene.